I first published this recipe in April 2014. A few weeks ago in my Thermofunkies Members facebook group we were talking about this recipe. Jenene said this also works with zucchini and carrot OR just 200g carrots! Jenene also reduces the sugar to 180g. Emma another member, said she likes to add a tsp of cardamom too! This is the most amazing cake. 23 seconds in the Thermomix! 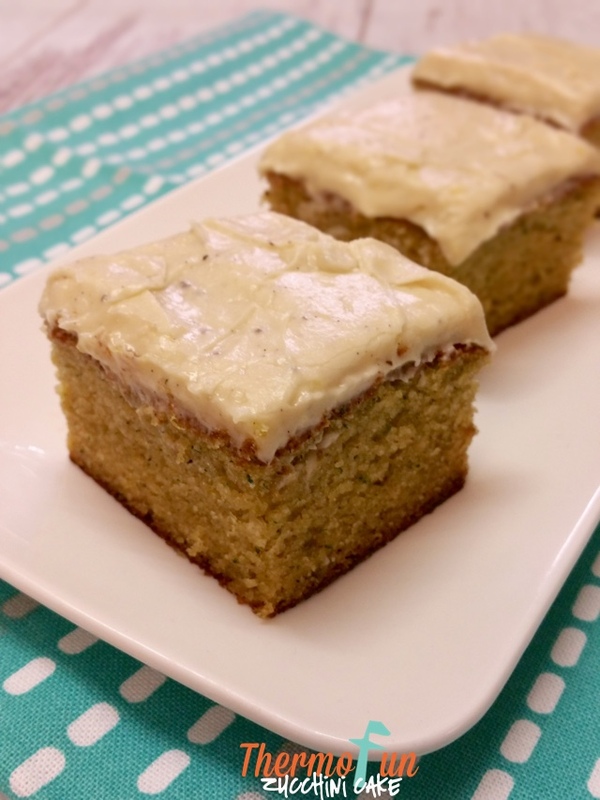 There is no need to squeeze the moisture out of the zucchini and as a benefit to this it keeps the cake so moist for days and days. I love the thought of having hidden vegetables in cakes, as then I don’t feel guilty for indulging! 🙂 This cake also is sensational even without the cream cheese frosting. I took the cake to work and it was demolished in literally seconds and everyone wanted the recipe for it! Preheat oven to 180°C. Grease a 23x33cm tin. Place sugar into TM bowl and mill 3 sec / speed 10. Add eggs, oil, vanilla, half the lemon zest and zucchini and mix 10 sec / speed 6. Scrape down. Add flour, baking powder, bicarb soda and salt and mix 10 sec / speed 6. Bake for 20 to 25 mins. NB: time in oven can vary depending on the moisture in zucchinis. Place butter, cream cheese, vanilla, remaining lemon zest and icing sugar into TM bowl and mix 10 sec / speed 5. Scrape down and repeat. This can be made with gluten free flour and replace eggs with one medium size banana! Hi. I made this with coconut oil and it taste amazing. Thank you. At this time of year always looking for ways to use up zucchini. Hi I made this today and my toddler loved it kept asking for more. The sugar still had bits of it on the icing I don’t know what a did wrong . I put some orange on the icing it was really nice. Thanks for sharing its our family favourite now. Looks divine! About to attempt an eggless version…! oh I’d love to know how it goes with no eggs Lise – what will you sub them with? Am also going to attempt an eggless version… Have recently been subbing egg with mashed banana so will see how it goes! Might put in some ‘chia egg’ too. It’s also going to have to be gf…can’t wait to taste it ! It was fantastic! The banana added a nice flavour. Although I think next time I will use 1/2 oil and 1/2 milk (oat, we’re also dairy free) because I found it a little too greasy for my taste. I used a little more oil and added some water, which then made the batter quite runny so added about 50g more flour to thicken it up a little. Was very yummy, though my cake was decidedly green! I can’t get over how light and moist this cake is! It really is superb! I do have a question, possibly a silly one….I’m a 2 week old Thermomix newbie and have had more thank my fair share of baking flops! What is the reason to have baking soda and powder in the recipe? Is it possible to cut back on the baking soda? I swear I can taste it. My hubby thinks I’m crazy! Won’t stop me from having a second piece, though! I better hurry..everyone loves it! 🙂 it really is fantastic! yes it is really moist isn’t it Kelly. 🙂 The baking soda adds to the lightness of the cake, but you can leave it out if you wish. It just won’t be so light. If you can taste it, perhaps halve the quantity next time you make it. Sorry Silvana I haven’t heard of any yet for this cake. I have certainly reduced the sugar successfully so you could try that and see how you go. Thanks I will try making it tonight with a substitute and will let you know how I go. Hi I just tried this!! The bad news was my oven died as when I went to check the oven just wasn’t hot enough and the cake just wasn’t cooking! Will have to try this again! Very very yummy! It took more than 60 minutes for the cake to cook but it’s the first time I’ve cooked a cake in my oven so I’m not sure if it needs longer or if my ovens a bit slow. It’s is such a moist but springy cake. I have another zucchini in my fridge so I think I might make another one tomorrow for my dad. Thanks for the recipe. Everyone has loved this cake. Hi I was just wondering if I could use wholemeal plain flour? Also was wondering why do you use the plain flour & baking powder if this equals self raising flour, why not just use self raising flour? the usual reason for using plain flour plus baking soda is that allows you to control the ratio of flour to raising agent. And some countries don’t have SR flour so specifying plain plus baking soda makes it more widely useful. In this recipe the ration is about the same as SR flour, so it should be OK, you would still need the bicarb soda as well. I haven’t tried it with wholemeal flour but I would be keen to hear how it goes. i’ve just made this cake it is baking as we speak, I used rice bran oil as all had left in cupboard (didn’t see the comments re coconut oil – will use that next time) but I added Black Chia Seeds, LSA & Cocao be interesting to see how it turns out as I didn’t measure just a couple of tsp of each. Hi tested this out the other day, in the cake i used coconut sugar instead of raw sugar & i used half coconut flour & half wholemeal plain flour. I found that the amount of sugar in the icing was way too much(to sweet) so i will lessen that next time, as i didnt have any coconut sugar left i used raw sugar in the icing, i added more philly cheese & butter to try & unsweeten it a little, but must say the cake was eaten up within a couple of days, we all loved it, thank you for recipe. Next time I make it, I am planning on using all coconut flour & coconut sugar in both the cake & icing, fingers crossed it works. I am yet to receive my TM, and desperately want to try this recipe… Would I just bung it all in the good ole food processor?? okay, given the high praise I just read I will give this a go as have always been a bit hesitant in making cake with veggies – just a me thing…….. Stay tuned. Can anyone help I am cooking this now it’s been in the oven for 35 min and still completely wobbly in the middle. I have checked the temp and it is right. Sorry Shell just saw this now. It’s the weirdest cake as some do seem to take a lot longer than others. Amazing as usual! Have made this cake soooo many times, and always turns out a charm. Tomorrow it will be going to a bake sale to raise some money for my daughters dance club, and its always the first sold! I added frozen raspberries and it was delicious!! oh wow what a fabulous idea Kirsten. thank you for sharing. 🙂 Is there any chance you can recall how many grams you added? This cake is so versatile. I made it AGAIN today with g coconut sugar only as thats all i had. Turned out perfectly! That should say 100g coconut sugar, sorry! sooooo amazing made this last week and everyone loved it and one of our station hands asked for it for his birthday 🙂 So moist you don’t need the icing but the icing is lick your lips delicious. Well silly me ordered 2 x 500g packets of zucchini’s on my coles online order instead of just 2, this week oops. So I went straight to this recipe to use up some, I think I might make the other one as well with the pistachio’s and lime frosting, as I definitely have enough Zucchini’s. Thanks Leonie for yet another amazing cake recipe so yummy and moist. I made this gf and dairy free using Tofutti cream cheese and Nuttlex for the icing. It took a little longer than to cook, however it was very moist and delicious! Hi, thanks for this recipe. Delicious cake and gorgeous texture! I used a large baking tin as per your measurements, but it has come out pretty flat, so I will use a smaller square tin next time. I also reduced the sugar to about 90g. Thanks again. I made this and couldn’t to taste it, it looked amazing but it took longer for it to cook mine took an extra 30mins in the oven and once it was ready to eat all i could taste was the bicarb in it and i followed the instructions and i made sure i only put 2 tsp of bicarb in, its eatable but everyone says there is a funny taste to it…. i used a zucchini from my dads garden that is light green in colour and though that this may have been the problem with the longer cooking time as it may have been more watery than the normal dark green zucchini… did anyone else have trouble with the taste of bicarb? luck i taste tested it on my family before i took it to my friends house. oh no Cecilia 🙁 To be honest you are the first I’ve heard say that for this particular recipe. Hopefully others may have some ideas for you as to why this may have happened. I make this cake almost weekly, great in the lunch box (without frosting), also make it into cupcakes. I reduce the sugar by 100gms and sometimes replace oil with same amount of applesauce, works well every time. Today I made it with Gluten Free flour (250gm) and it turned out amazing. Until I tried this recipe I could not bake cakes and I was well known for my cake flops, now whenever I have to make a cake to take I trot this baby out and sit back and enjoy the yums! Thanks Leonie. I made this today but added lime. I replaced the lemon and vanilla in the batter with the zest and juice of 1 lime, and then replaced vanilla in the icing with the zest of 1 lime and the juice of 1/2 lime. It is really good! Is there a way this can be done with a little less sugar ? Juliet, I haven’t made it with less sugar but many others have and have said it turned out great. I think it will end up being personal preference to find what works for your family. I made this with a lemon drizzle icing as I didn’t have room in the fridge with cream cheese frosting. It was delicious and enjoyed by all. Just wondering if you can peel the zucchini? As my husband is extremely fussy and if he seen green specks in it he wouldn’t even try it. Love this recipe! Our daughter is allergic to eggs, so i use 3 tblsp of vinegar, and 2 tbls extra oil instead! I also halve the sugar and add 30g organic cacao powder to make ‘chocolate muffins’ my 3 kids devour them!!!! Sometimes ill peel them and add white choc chips (instead of cacao powder), for something different! They really are a no fail cake or muffin recipe!! Thank you Natasha, fabulous to hear the vinegar and extra oil subs well too! Great to hear re the cacao too – I’ve also done that and it worded a treat! Yum!! This is my go to zucchini cake. Today I added 30gms of cacao powder and the zest of an orange instead of lemon. This is AMAZING! My fiancé HATES zucchini so I snuck this in and he LOVED it! (Wasn’t too chuffed about being tricked 😉 ). I gave some to friends and neighbors and they all loved it too! I’m going to try it again but cut back on the sugar so it’s not so bad for you! Yum! I made this and it was delicious! I only used 100 grams of sugar. And I used half oat milk/ half coconut oil.